Single digit division is a soft entry into the world of mathematics, but it can still be a bit tricky for young children. If you want to give your child a little single digit division help, or you need a little help teaching single digit division at home by yourself, try out these amusing games that will engage your child in learning division, as well as other math skills. Kids speed through math facts with this timed test. In this math exercise, students will demonstrate their multiplication and division facts fluency. Is your kid up to the challenge of division? Start him off with this basic division worksheet that helps him get on the road to long division! Division Word Problems: Divide 'Em Up! Kids use details from word problems on this third grade math worksheet to construct and solve division problems in which a multidigit number is evenly divided. 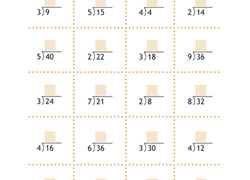 Help your third grader practice drawing fractions and finding equivalent fractions. Test your third graders math skills with this one minute exercise to see how fast they can complete multiplication and division problems. Find what is hidden in this color by number worksheet! Color-coding answers can help your child practice and memorize division facts and practice creativity. Kids complete each equation on this third grade math worksheet by determining whether an equation is multiplication or division and writing in the correct sign. Challenge your third grader with some basic division problems and then use his answers to complete a color-by-number division masterpiece! 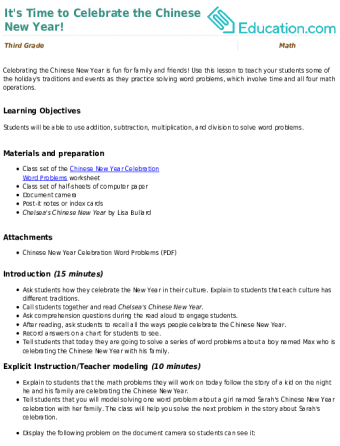 In this activity, practice drawing an array for each division problem, then record the quotient on the answer line. Make math practice fun with this division sheet! As she solves the problems, your child will uncover a hidden phrase at the bottom. Celebrating the Chinese New Year is fun for family and friends! Use this lesson to teach your students some of the holiday's traditions and events as they practice solving word problems, which involve time and all four math operations. Did you know numbers make up families, too? Use this multiplication and division fact family worksheet to help your 3rd grader with fast math skills. This resource gives your students practice with division by using the strategy of repeated subtraction. Use this worksheet to practice long division with one-digit divisors. 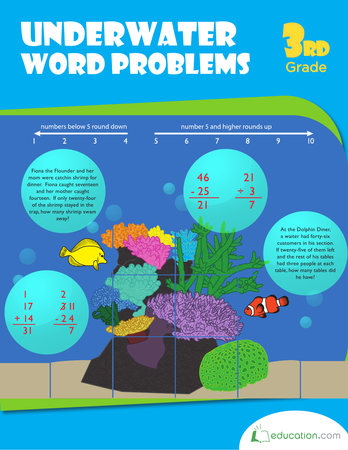 Dive into underwater themed word problems to discover numbers to round, and multi-step problems to put kids through the four operations. Solve division problems using one of four strategies: by drawing an array, by drawing equal groups, using repeated subtraction, or with a multiplication sentence. Happy Valentine’s Day! Use this fun hands-on lesson with your students to practice solving division problems with one-digit divisors. 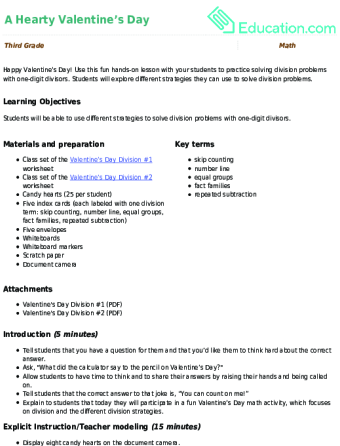 Students will explore different strategies they can use to solve division problems. This workbook is packed with worksheets that let kids sharpen math skills by practicing the four basic math operations as well as factoring. Use this two-minute drill to assess your students’ fluency with basic multiplication and division facts.